In the picture it looks like the band is done in rib stitch, but the pattern just says too sc in each stitch. I’m afraid if I do that, though, that it will be too tight to wear. Can you clarify that for me? It is definitely only sc stitches. You are making the band first then sewing it together, so you can make it as wide as you want before you start adding the body of the pattern. I’m using slightly lighter yarn so needing to do a few more rows than the pattern. I’m worried that it’ll be too gathered and bumpy when I join at the top? You can do some decrease sc stitches before you join. That would probably help. You could probably do a couple. How often are you decreasing? If you had 72 stitches, I would probably decrease every 6th stitch and do two rounds of decreases. before even starting the body of the hat… there are 72 rows? did i read this right? That is the brim of the hat. I crocheted 72 rows which measured around 20″ for me. I then joined the ends to form a circle. Once you’ve done that, you’ll start the body of the hat. Hi I am new to your site. 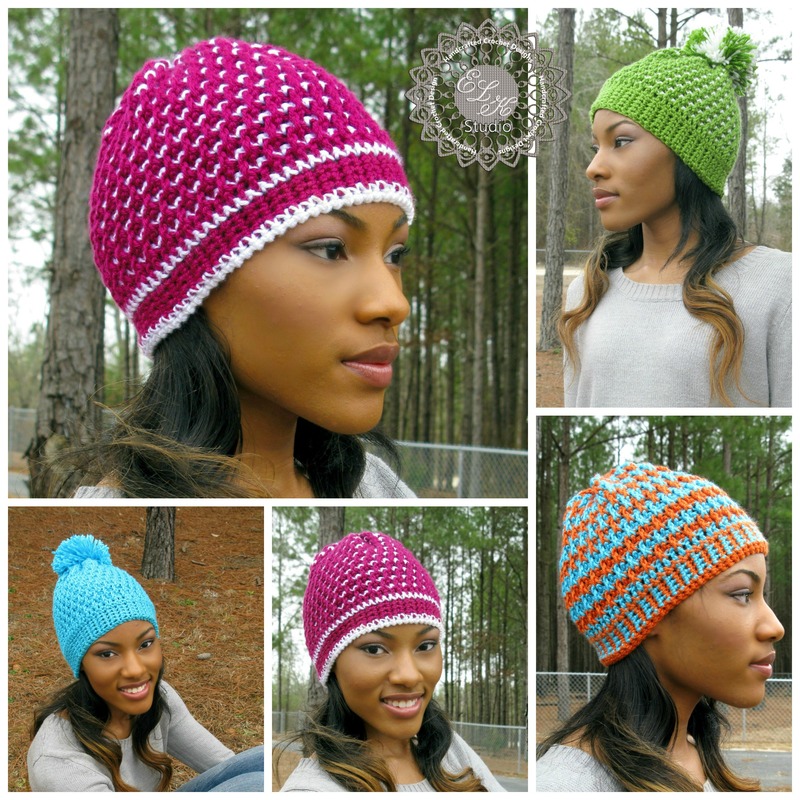 I have been crocheting for years but have never made such a beautiful hats. I making the orange and turquoise and I’m confused I know you you said to follow the raspberry colored hat directions, but I’m not having luck of coming out right. Should my single rounds be orange? that’s what I really stuck on. Make sure all your single crochet rounds are the same color. I think that will help you. Hi, I am really excited to make this hat, it looks like a wonderful pattern! I jus had a quick question, I was looking on the pink and white color scheme, How you get the stripe of white at the top and bottom of the band? I understand how to do it in the rounds but I feel like I am missing something in the band part. The white at the bottom of the band is where I crocheted evenly around the bottom of the pattern and the top is just a round of sc stitches evenly around. (Sort of making spaces if you will). I hope this helps. This is SO lovely. I am just in few trouble to understand the patterns. Anyone have pics from how it will be diagonal in the finished pattern????? When I tell you to skip a sc and fpdc in round below, you will basically be doing the fpdc around the dc directly below the skipped sc on the previous round then dc in the current round and repeat. Does this help you? Thank you so very much for morning frost pattern. It is such a beautiful hat and you are a beautiful person for sharing. Your work is just BEAUTIFUL. I’m new to your website and skill. I went through your ravelry store, and I love your stitch combinations and color choices. Thank you for sharing your skills, and for so many free items. I love free, don’t get me wrong, but you could easily charge for most all of them, and still get a lot of customers! Once I noticed that you did have the pin at the bottom, I started pinning the ones I downloaded. Hopefully that will get a little more notice than I myself could give you. I need help on the Morning Frost hat. I am trying to figure out row 4. When I fpdc, am I actually doing it in the row of sc right below it or the row of dc that is below the sc? When you skip the next sc, you will fpdc around the post of the sc directly under the skipped sc. This is what creates the diagonal type of look. Just finished my hat, great pattern and very detailed instructions. Thank you very much! I love this hat pattern. Thank you. I do have a question about the back seam. Should it be on a diagonal. I am pretty sure that is correct but how about the second color being so visible on this seam. Am I joing my yarn incorrectly? The seam will run diagonal. I didnt have an issue with the seam on changing to the second color and joined it as i would any other project. Im sure you are joining correctly. I did just carry my yarn up though and didnt cut my yarn. It didnt make a big difference if you changed every other round for me. I hope this helps. If you follow the pattern, you’ll see the round of sc stitches followed by the next round of fpdc/dc stitches is what actually makes the “window” appearance of the pattern. You aren’t really doing anything special to get the look…it’s just the way of the pattern. At this time, I don’t currently have a tutorial of this pattern. I’m sorry. Maybe I can do one in the future. Hi, is there a way to turn the pink and white one into a slouchy hat? I’m not sure if continuing to do the rounds would actually work because of the texture of the hat but you could always give it a go and see what happens! Would you please post a picture of what the inside view looks like. I think I have made an error because row 6 has formed a ridge underneath. I no longer have this hat to show you the inside. You shouldn’t have a ridge though. I want to make your hat in 5ply can you help me. What adjustments should I make? Since you start with the brim of the hat, I would crochet the band until you reach 20″. Once you start the sc around the brim, just make sure you are using multiples of 4 for your first round of sc stitches. I hope this helps. You’re amazing. So glad I found your patterns. I’m co-hosting a crochet for chemo event. We will be using your patterns. I will definitely like your patterns on Ravelry. Thank you so much! Yay! Im so glad you love them! I wish you all the success with the event! Hi, I am a beginner at crocheting and decided to try to make this hat for some Christmas presents. No problems until the end. I am not sure how to weave and fasten off the hat. Do I used the same strand or cut off a different strand for the weave? I’m just not sure how to go about it. Don’t cut your yarn. Leave yourself a long tail and thread your tapestry needle. Take the needle and weave through every other stitch. Once you’ve finished, pull the yarn and it will close up the hole then weave in that part of the yarn to keep your hole closed. Does this help? Hi, I absolutely love this hat and am still a beginner when it comes to hats. I was a little confused though, does the slip stitch count as a stitch? The sl st does not count as a stitch. Good luck which the hat! Kathy: thank you so much for making this a free pattern. I’m still a beginner but I’m going to try to make a hat to donate. I’ll take a pic to share when I’m done! Thank you so much! I would love to see it! I know your talents will be appreciated by the person receiving your donations! Kathy – I absolutely love the look of this hat, but it just isn’t coming out like the pictures. I’m hoping you can help me figure out where I’m going wrong – trying to make the raspberry version of this hat. Once you whipstitch the band together, what direction am I supposed to crochet the first row of single crochets? 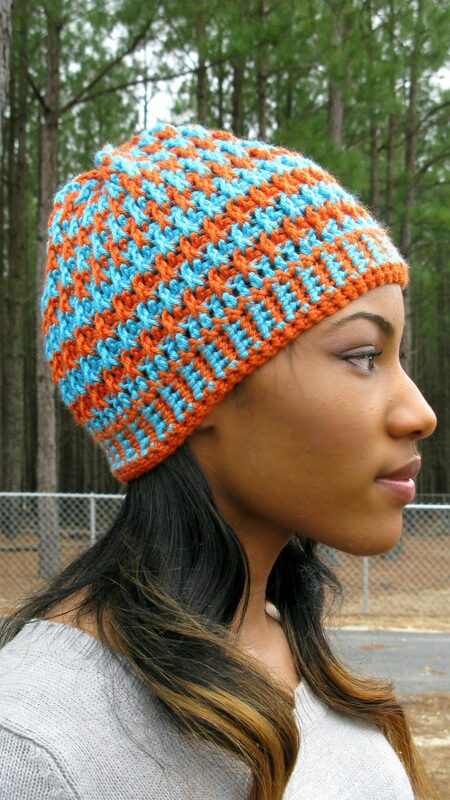 Do I crochet so that I’m looking at the inside or outside of the hat? Also, in row 6, what do you mean by fpdc in round below skipped sc? the “round below” part doesn’t make sense to me? If you are right-handed, crochet counter-clockwise like you normally do. You aren’t turning the hat. Round below means to work on the round you completed previously, not the current round you are on at the time. Hope this helps. Thanks Kathy – I figured out the fpdc in the round below part. My single crochet rounds still “look” different….are you by chance left handed? I’m wondering if that is the difference – I realized that the single crochet rounds look inside out to me based on the picture. Oh my! Thank you so much LaRonda. I’m so glad you’ve been inspired! I’m sure you are such a blessing to your family and all the others too! Thank you so much for your gorgeous patterns. I made this one in gray and pink as a chemo cap for my sister battling breast cancer. She loved it! I’m sure it’s beautiful Denessa. Prayers for your sister. For this pattern, your ch 3 does counts as a double crochet. The ch 1 does not count as a stitch. When you are changing colors, do it on the last stitch prior to the sl st. You will work the stitch as normal and when you have 2 loops on the hook, change color then sl st. I hope this helps. Let me know if you need any other help. Thanks so much. Love the design and texture–very creative and unique. I’ll post a pic on Ravelry when I’m done. Thank you very much for making this beautiful hat a free pattern – my best friend is in the hospital undergoing chemo & radiation – this is going to be perfect for her to cover up the loss of all her hair. I know she will be so blessed when you give her this hat! I’m so honored for the hat to be considered a chemo hat. It blesses me. I pray for a healing of you friend’s body and restoration. You will weave every other sc just on the last round. Let me know if you need any other help!! Absolutely beautiful! I’m definitely going to try my hand at this hat. I’ve never worked a hat from the bottom up before. I can’t wait! If I’m successful I will definitely be making more of these and sending them to various hospitals. Thank you for making it free….especially since I know you didn’t have to and thank you for sharing. i will definitely be sharing on my FB page and I will go to ravelry right now. Enjoy the pattern!!! It’s really a lot of fun to make. I’m working on this now. It’s such a beautiful pattern but this is my first hat project and I’m getting myself confused. Is there some sort of decrease that happens in rows 6-22? Also, do the fpdc stack over each other or stagger? It looks like they may stagger but that’s not how it’s working out for me right now. Thanks! You won’t decrease. When you work round 23 and pull tightly, the hat should be okay. The fpdc’s do stagger. Go back and read the pattern and see if you see where at the end I’ll tell you to sl st to the first stitch to join your round right? Then you will sl st again in the next stitch before you ch 3. That’s what will make it stagger. Let me know if you need any other help. So there are 23 rounds ending with sc? I was wondering how you weaved in every other sc. I have a video demonstrating how to close up a hat. Click HERE for the link. Love this hat made it into a slouch hat with gray and white looks great thanks for the pattern! I wondered when someone was going to make it into a slouchy hat. Glad you enjoy! This is the neatest hat pattern! I used a bright varigated yarn for the single crochet rounds and it came out looking like stained glass. Each little “window” shows a different color. Since this one is a gift, I’m going to make another for myself–or make another for the gift and keep this one! Thank you so much for sharing! Love your hats and thank you so much for sharing your patterns. Hi Kathy, Thank you so much for this fab pattern. I have added it to my favorites on Ravelry and shared it on FaceBook. You are so generous! I can’t even guess how many of your houndstooth hats I’ve already made, so i am really looking forward to making this one. Love your patterns. Thanks again! Thanks for the hat. I also doing hats for chemo patients. Always hunting new hats to do. Love it!! Would have paid for it ! Thanx !! The hat is beautiful I am in love with the design. Although you could have sold the pattern and I’m sure many would have payed for it you are giving it for free. Thank you so much for being so kind….may god bless you ..
We will be working on these for our Crochet for Cancer group, called Hooks of Hope https://www.facebook.com/HooksofHope We are a nonprofit group that donates handmade items to local cancer centers and patients. Thanks so much for posting free patterns, we always love trying something new. Love to hear it! What a wonderful and kind act to serve others and it’s really a privilege. The hat is thick and will certainly help! I know it looks that way, but I don’t. Once you start the hat, you’ll see what’s happening. Love the pattern. Going to make it as soon as I finish this order WIP. Thank you for such kind words. My family is truly blessed! I hope you enjoy the pattern. Thank you for linking to my pattern. I pray it will always be used for people in need.